Keeping your four-legged friends fashionable is a must, especially if they are Instagram famous! 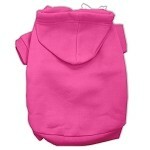 Our collection of cool hoodies for dogs come in a variety of styles as well as the option to design your own. If you simple want a hoodie or dress for your pet, you can also order them blank. Hoodies come in a variety of colors and have white drawstrings in the front. Each hoodie has a hole for your leash to go through on the nape of the neck. See the size chart for hoodies and dresses below - both products run small, so if in doubt, size up. If you are located in Chicago you can schedule a fitting for your pet in our West Town showroom! Each puppy dress has a top section that is similar to a dog t-shirt, with an attached ruffle. We also have ready-made designs and template for your pet's custom gear. Bring your ideas and let's Get It Made!